He studied in Athens at the School of Fine Arts (1920-1926) and in Paris (1930-1935) at the Académie de la Grande Chaumière and in DimitriosGalanis’ studio. In 1932, he participated in the Salon d’Automne, in which he earned an award, and in 1934 he published a large-format bookin Paris of 21 woodcuts depicting Mount Athos, with a foreword by Charles Diehl. He travelled to Europe and America. In 1935 he movedto Thessaloniki, where he taught drawing at the Experimental School and the Aristotle University of Thessaloniki. He received awardsin international painting and printmaking exhibitions. 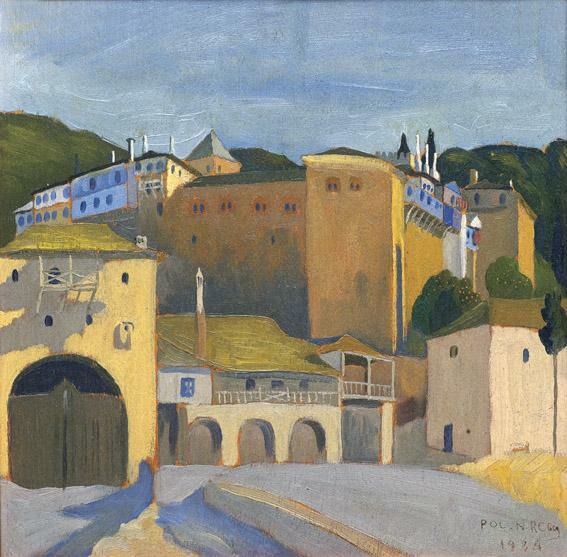 In 1980 a retrospective exhibition of his work was held at the National Gallery inAthens and in 1983 at the Vafopouleio Cultural Centre in Thessaloniki. He painted landscapes, portraits, still lifes and genre works, as well as mythological and religious themes. He also painted churches andportable icons. His style was influenced by Byzantine art and by his teachers, as well as by artists such as Konstantinos Maleas, SpyrosPapaloukas and André Derain.